Scenario: Your cardiac patient took aspirin prior to your arrival and you need to document this. Change to the Provider Actions menu and Medication tab and click the Add button. Fill in the necessary files. 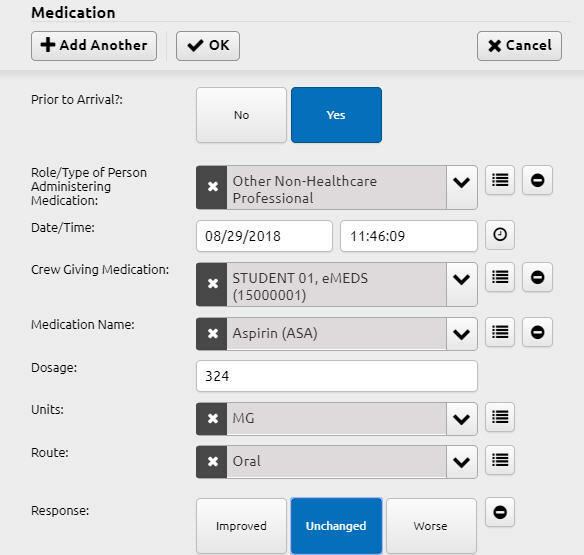 For the Crew Giving Medication field, use either Other Non-Healthcare Provider (for people unrelated to healthcare organizations) or Other Healthcare Provider (for doctors, nurses, hospital/urgent care personnel, etc).